The scalloped part means thin sliced. 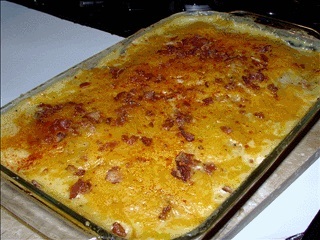 Other than that, there are a myriad ways to make scalloped potatoes. This is just a basic recipe that you can add or subtract to make your personal favorite. Reserve 2 tablespoons of butter. Melt remaining butter in sautéé pan. Cook onion over medium heat, stirring often, until tender. Add flour and stir until well incorporated and cook for a minute to remove the flour''s raw taste. Add milk, cook while stirring until mixture thickens and boils. Spray 8- x 8- x 2-inch casserole dish with vegetable spray. Place sliced potatoes in layer in dish. Divide sauce between layers finishing with a layer of sauce. In separate pan, melt remaining 2 tablespoons of butter. Remove from heat and stir in cracker crumbs. Sprinkle evenly over the top of the potatoes and sauce. Cover dish with foil. Bake in preheated 375°F. oven for 45 minutes. Uncover and bake an additional 15minutes or until potatoes are tender.Garnish with a sprig of rosemary in the last 10 minutes of cooking. It is usually a good idea to place a foil-covered cookie sheet on the oven rack under the casserole dish in case of boil-over.